Leonard Cohen. Courtesy of Old Ideas, LLC. Leonard Cohen left the world a singer/songwriter, a man of letters, an artist and a global icon. In 2016, the Musée d’art contemporain de Montréal (MAC) began putting together an exhibition celebrating his life and work by commissioning artists to create pieces around Cohen and his legacy. He passed away before the exhibit opened but lived on through the extensive and immersive works put together by MAC. Leonard Cohen: A Crack in Everything will now begin its international tour in a place paramount to the artist’s creative life, New York City. The Jewish Museum will host the show from April 12 through the summer. A Crack in Everything has changed form since its MAC debut, reorienting to fit the Jewish Museum’s intimate galleries which affords each piece its own special viewing experience. The sound-padded rooms orchestrate a singular focus on Cohen through the eyes of the artists. George Fok’s Passing Through is a focal point of the show with a hour-long, multi-screen video celebrating Cohen’s singular voice, his music, his charismatic persona and inimitable stage presence. Listening to Leonard, 2017. Multimedia audio environment with sound recordings of Leonard Cohen compositions produced, arranged, and performed by a group of musicians and vocalists. Exhibition view of Leonard Cohen: A Crack in Everything presented at the Musée d’art contemporain de Montréal, 2017-2018. Photo: Guy L’Heureux. 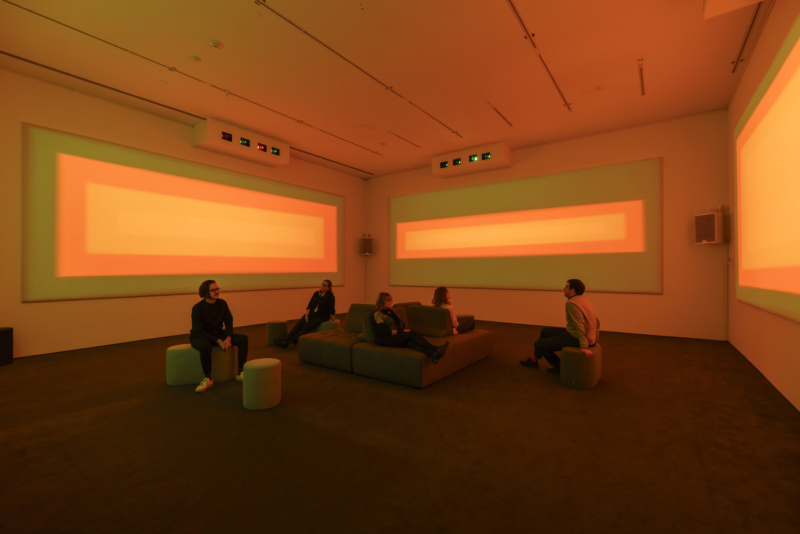 The third floor of the exhibit is dedicated entirely to Listening to Leonard, a room scattered with floor cushions and lined with geometric projections that shift according to song. The piece features covers of Cohen’s most iconic songs by artists including Feist, The National with Sufjan Stevens, and Ariane Moffatt with the Orchestre Symphonique de Montréal. New York-based designer Nili Lotan was integral in bringing the show to the city and to The Jewish Museum, in particular. The designer spoke to Cultured at the opening party, “It is a natural choice for me to sponsor this show with this museum. I have always loved Cohen’s relationship to poetry, how he draws inspiration from across different media and genre…His music has the ability to be both self-assured and inquisitive, a balance that resonates with my own work as well as my Judaism.” Lotan designed a shirt featuring Cohen’s lyrics “Dance me to the end of love” that will be available in the museum as well as in her own stores. “Leonard Cohen: A Crack in Everything”will run from April 12 through September 8, 2019 at The Jewish Museum on 5th Ave and 92nd Street in New York.